Struggling to think of something different to give? 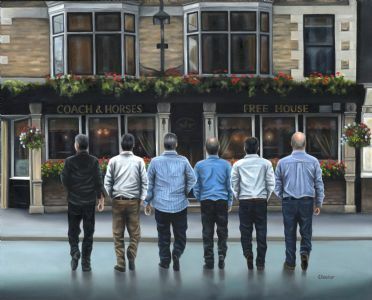 Why not commission a painting for either yourself or a personalised present? I will consider painting most things from, homes and buildings to landscapes and seascapes. 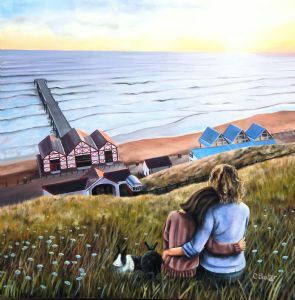 Just imagine a painting set in your favourite location with either yourself or your loved ones in the scene? I always work very closely with my clients at every stage of the commission. After an initial conversation to discuss personal requirements, I use photographs either taken by myself or provided by the client, to edit to a final composition. I will only start painting once this has been decided between us both. Paintings can be on either quality stretched canvas or board to be framed. I can arrange framing or I can provide unframed. These amounts are merely a guide. I provide clients with a personalised quote as every painting is different. If there are numerous photographs which need editing together to create a final composition, the price will be adjusted accordingly. 12" x 12" start from �895. 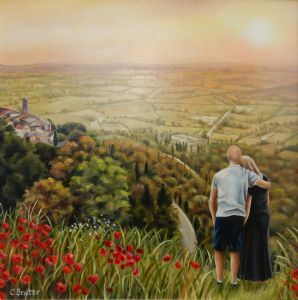 If you are interested in commissioning a painting, please contact me and I can give you ideas and a personalised quote. Here are a few testimonials written by previous clients. Thank you to those who have contributed. 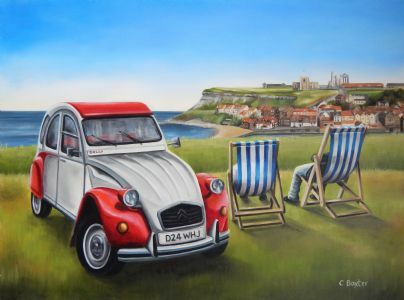 "I contacted Claire when I had an idea for a painting as a Birthday present from my wife Angela, the idea was based on one of our motorcycle trips abroad. This trip was centered in Venice and the fact that all the photographs that were taken were lost when the hard drive gave out, Angela had kept only one print in her handbag, this is the main image of the Gondala and the Arch. However during our stay we had also found and fallen in love with a piece of Marano sculpture of the two intertwined lovers kissing, my ask was for a larger version of the only photograph but with the sculpture placed on the window ledge. The assistance that came form Claire both in the imagination, skill and patience were very welcome, however it was Claire`s warm and welcoming nature that immediately put me at ease. Put simple in an age when superlatives trip off the tongue as easy as please or thank you. 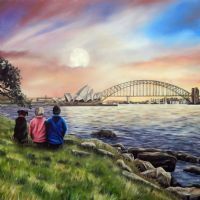 Quality, Craft, Talent, imagination and the abilty to connect with a client leaving a result that lasts, as you can not look at the painting without remembering the personal qualities of the Artist. Thank you Claire for the very bottom of my heart." "Claire has been a delight to work with, from first approaching her with an "idea". 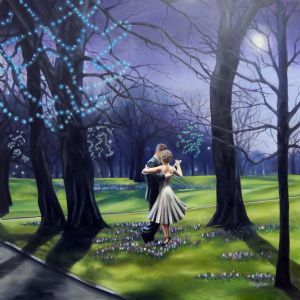 It was the first time I had considered commissioning a painting and Claire was so patient with my queries, helping with various sketches and keeping me informed throughout the whole process, delivering on time and budget (surprise birthday present for a family member). Overall though, she captured the image I wanted in painting form better than I could have hoped or imagined- so much so, the recipient was close to tears when they received it. It shall be treasured. Thanks Claire!" "I contacting Claire after my husband and I received a wedding gift from our friend of a couple dancing that had been done by Claire. I instantly fell in love with it and felt it told a beautiful story. I contacted Claire to see if she could paint me a picture from pictures from our honeymoon as a first year anniversary present for my husband. She was delighted to help and kept me up to date with sketches, ideas and questions on other significant things she could put in the picture. I remember my excitement the day it came and how overwhelmed I was when I saw it. She had truly captured us perfectly and again told a story even though she had never met either of us. My husband was truly touched with the gift and now we have a one of a kind reminder of a most special time for us. I would not hesitate using Claire again and I have told friends the same." 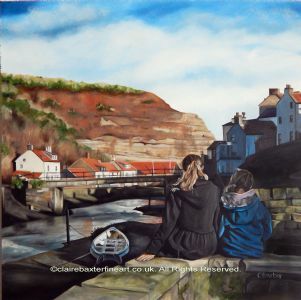 "Claire took the time to get to understand the style of painting I wanted. She suggested I consider local scenes that meant something to me and to send pictures of this and the people in the painting. 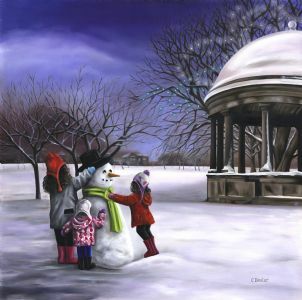 She then worked up sketches of different pictures, we loved a particular sketch so we commissioned Claire to paint it. As I needed the painting for an anniversary she worked hard to complete on time, providing us with updates as the painting developed. The completed work exceeded my expectations, capturing the scene perfectly. 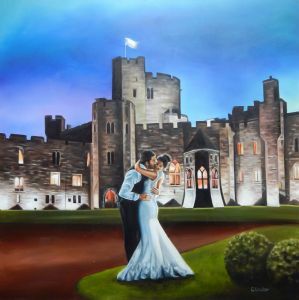 Thank you, a cherished painting, I would have no reservation recommending Claire." 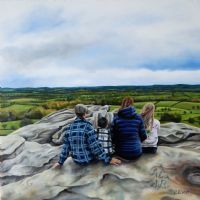 "After seeing Claire�s lively and expressive work at an exhibition in Skipton, my wife and I commissioned two paintings featuring my four grandchildren in one and my son and his two children in the other. The whole experience was a pleasure and could not have been easier - she discussed our requirements and produced a pencil drawing prior to undertaking the actual painting. 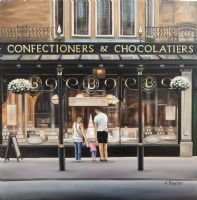 We were delighted with the results and both paintings have received many compliments from our friends and relatives - not the least the grandchildren."